From soil that was insufficiently compacted to extensive water damage to poor maintenance around the area, your foundation can be the source of many problems that can threaten its very stability. Foundations settle, soil or clay gets tamped down, water accumulates around the foundation after storms: these things all can and do happen. Even the most secure foundations can be no match against these long-term effects. Of course, the most common and news-worthy cause of foundation problems is seismic activity. Even a series of very small earthquakes can do lasting damage. Many of the indications that your foundation has suffered damage aren’t smack-you-in the-face obvious, like a sloped floor. The signs can manifest in more subtle ways, like tiny cracks in your walls and ceilings, doors that don’t close properly and windows that are difficult to open and close. Those are signs you can SEE. Imagine what you can’t see? A foundation contractor Los Angeles can search for those hidden clues that show wear and tear on your foundation, such as cracks, slippage and water damage. Let’s explore the biggest problems with your foundation and what can be done about them. Not all cracks signal severe foundation problems. Some are normal, due to settling. It’s all in their direction and size. Thin, vertical or diagonal cracks that measure less than a quarter inch on foundations and walls are considered a normal part of settling. They’ve likely been there for many years and will be for many more. Consider sealing them to prevent water from getting in, but otherwise, you don’t have to worry about them too much. If you have wide cracks that run horizontally, there is more cause for concern, as this could signal a bowing foundation. These should be addressed by a professional as soon as possible to prevent structural failure. If you notice standing water or moisture in your crawlspace or basement, this can signal poor drainage. Pooling of water around your foundation can cause big problems, as it can sink into the compacted and moisture-rich soil over time, causing serious settlement. On top of that, you have to worry about mold growth. Moisture can also cause damage to any wooden posts and supports underneath your house. If those posts are rotten or bowed, this is a sign of foundation damage. Installation of a French drain is a common solution to water problems. Always ensure downspouts are pointing away from your home as well. This is a condition in which the soil under your foundation surges up as it expands or swells. A sudden increase in moisture can trigger this. If your home is suffering from foundation heave, you won’t necessarily notice cracks on the outside foundation walls, but on the interior partition walls and floors instead. Another cause of foundation problems can involve your stem wall. A stem wall sits on your concrete slab, acting as the base structure to which other walls and floors of the house attach. Finally, foundation problems can manifest themselves in crumbling, chipping and flaking. These are all good reasons to consult with home foundation contractors immediately. Foundation repair in Los Angeles isn’t as daunting as it may sound, but it does have to be done by a professional. 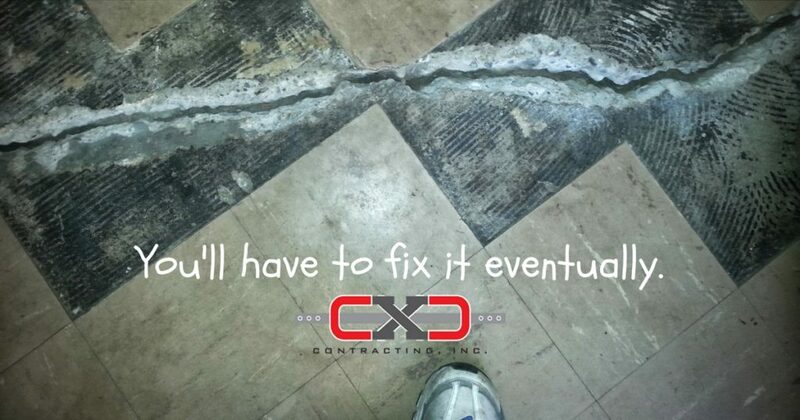 Here at CXC Contracting, we know you’re concerned about uprooting your family and facing disruption to your daily life. That’s why you can trust us to deliver the best results with minimal downtime. The first step in the process is to visit your home and diagnose the problem. Then, we will fix the problem using hydraulic jacks, structural reinforcements, house bolting and filling materials. There are a variety of solutions we can apply to your foundation problem, depending on the severity and cause. After inspecting the area, our home foundation contractors will advise you on the best course of action and give you an estimate. Don’t wait until an earthquake reveals the true inadequacies of your foundation. Act now! If you’re looking for a contractor in Los Angeles you can trust, contact CXC Contracting at 805-300-8899 or schedule your free inspection online today.